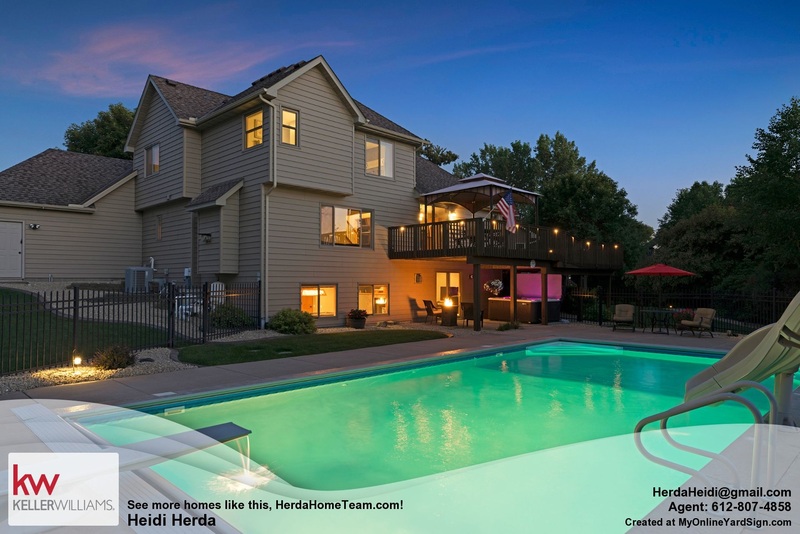 Heidi Herda Champlin Realtor Sells 9487 White Oaks Ct in just 3 days! Heidi Herda YOUR Champlin Realtor® & Resident! Exceptional, newer home with updates galore! 3 spacious bedrooms on one level, including a master suite and private master bath, open kitchen, updated with granite island and walkout to deck, perfect for grilling and entertaining! Enjoy the cozy living room space with built-ins and a gas fireplace. Fully finished lower level is built for entertainment and fun! Updated to a fun country style with a tin ceiling, bar and built-ins this will be your favorite 'indoor' spot in the house! Just wait for the outdoor space to impress your guests! With gardens abound, a running waterfall and paver patio, this will be your favorite outdoor space! Hurry! This one is one of a kind!! This amazing home for sale with a pool sold in just one weekend! The activity was steady as soon as the listing went live! We had multiple showings and multiple interested buyers, we settled on a full price purchase agreement just 3 days on the market, $439,900. Some minor concessions were given to the buyers in the form of a price reduction. This Champlin home sold and closed on December 17th with only 11 total days of market time including the inspection period, the final price was $439,300. Curious how this sale changes your home value??? Text '88838' to 888-264-1910 for your text home value!! See more Champlin homes for sale like this! Thinking of selling Your Champlin Home? Curious how these sales affect your home value? Check the recent homes sales near you, or visit MyChamplinHomeValue.com to get a free home value estimate!! Why Do People Live in Champlin? Champlin is snugly situated near the Mississippi River and offers affordable housing. Champlin has more than a handful of parks which include Andrew's Park Splash pad, Northland Park, Elm Creek Park Reserve, Oxbow Park, and a Skate Park, Lifetime Fitness, ice rink, Mann Movie Theater, The Champlin Library and easy commuting access to Highway 169 and Highway 610 to help your morning commute. (Search all Champlin Community has to offer). Champlin is said to have a small town community feel by local Champlin homeowners. Champlin also offers great restaurants such as Ruby Tuesday's, Willy McCoy's, Clive's Roadhouse, Buffalo Wild Wings, Maverick's and Coming soon...Chipotle, Leeann Chin, and Starbuck's! !, easy access to local grocery stores, Cub Foods, Caribou Coffee, Chinese Restaurant, and a few Fast Food locations, Wells Fargo, and Target are just around the corner. All the conveniences and a little smaller community feel than the neighboring Brooklyn Park and Maple Grove areas. What Schools will the Kids Attend in Champlin? If you buy a home for sale in Champlin, it's likely that your kids will attend Oxbow Creek Elementary, serving grades K-5, located at 6505 109th Ave. N | Champlin, MN 55316 | P: 763-506-3800- See Oxbow Creek Elementary School Website (see all homes for sale near Oxbow Creek Elementary), Champlin-Brooklyn Park Academy, serving grades K-5, located at 6100 109th Ave N l Champlin, MN 55316 l (763) 506-2000, your other option for a local Elementary School is Dayton Elementary School, serving grades K-5, located at 12000 South Diamond Lake Rd. | Dayton, MN 55327 | P: 763-506-2200 - See Dayton Elementary School Website (see all homes for sale near Dayton Elementary School). Jackson Middle School, serving grades 6th-8th and located at 6000 109th Ave. N | Champlin, MN 55316 | P: 763-506-5200, See Jackson Middle School Website (see all homes for sale near Jackson Middle School), Champlin Park High School services grades 9th-12th and is located at 6025 109th Ave. N | Champlin, MN 55316 | P: 763-506-6800, See Champlin Park High School Website (see all homes for sale near Champlin Park High School). If you're looking for specific specialty programs, Champlin offers access to magnet schools and unique school opportunities for elementary, middle school and high school students through Northwest Suburban Integration School District (www.nws.k12.mn.us). This is a great opportunity for children that excel in engineering, mathematics, and science. See more Champlin School information according to GreatSchools.org. Local Preparatory Schools also include Parnassus Preparatory School, Maple Grove (see homes for sale near Parnassus Preparatory School) and Athlos Leadership Academy, Brooklyn Park (see homes for sale near Athlos Leadership Academy). If you're looking for a local, rigorous, Christian Academy, Maranatha Christian Academy is located at 9201 75th Avenue North, Brooklyn Park, MN 55428 | Phone: (763) 488-7900 - Maranatha Admissions Information, Find Homes For Sale near Maranatha Christian Academy. Save money with Homes for Heroes! Homes for Heroes is a national organization giving home buying or selling rewards to a local teacher, police officers, firefighters, Veterans, Military active, non-active and retired, plus healthcare workers such as Nurses, Doctor's and EMT's! On average our HEROES, are earning $1,500 or more back in rewards for their service to our community! Don't miss this no-red tape opportunity to get your well-deserved benefits just for helping our youth succeed. Follow this link for additional details on the program, entrance is FREE... Homes for Heroes!! Login - NOT limited to one service or another, cash out on the benefits when you sell and buy! Combine with Keller Williams ZERO mortgage... and save thousands!!! - get more details here or click to download the app and get started with your preapproval!! !